Is Gwyneth Paltrow Going to Be on Girls? 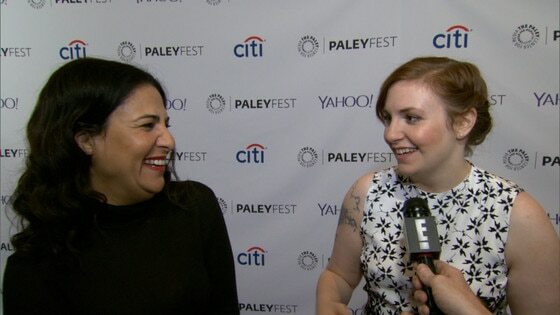 Kerry Washington isn't the only mega-star Lena Dunham wants to see on Girls. She also wouldn't mind adding Gwyneth Paltrow to her long list of celeb guest stars. "We would love it," Dunham told me at the Girls PaleyFest panel. "Fingers crossed," her producing partner Jenni Konner added. Dunham said, "We'd be very grateful." She and Konner recently had an Instagram lovefest with the Oscar winner. Dunham marked her first "foodgram" when she posted a photo of turkey chili that Konner had made from a recipe featured in Paltrow's cookbook, It's All Good: Delicious, Easy Recipes That Will Make You Look Good and Feel Great. Fact: @campsucks makes a mean turkey chili care of @gwynethpaltrow's It's All Good. This is probably the only foodgram I'll ever do- I just felt so loved ?????? Another fact- as I took home my doggie bag Jenni joyfully yelled "it's protein packed!" "Fact: @campsucks [Konner] makes a mean turkey chili care of @gwynethpaltrow's It's All Good," she wrote. "This is probably the only foodgram I'll ever do- I just felt so loved. Another fact- as I took home my doggie bag Jenni joyfully yelled "it's protein packed!" Dunham told me, "Jenny made me that chili and I took it back to the hotel where I was staying. I had room service heat it up for me and then I just couldn't shut up about the chili!" Paltrow Instagrammed back, "that's my GIRLS! well done @campsucks @lenadunham #goopmake #regram." Talk about a couple of Goopies! "We love her so much," Konner said. "She's like the funniest, greatest girl and that cookbook…is like my bible!" So who wants to see Gwynnie on Girls? Who should she play? Leave your suggestions below. Gwyneth Paltrow Guest Starring on "Girls"? PHOTOS: See which TV shows your favorite stars geek out over!